A little bit ago, I was having a pleasant conversation with Scotty McLeod, an 89 year-old “Duluthian” and frequent golfer here at Enger Park Golf Course. He shared with me an amazing story of how he learned to play the game, and a familiar name popped up. Scotty recalled how difficult golf was for him, especially since he was just learning how to play in his mid-forties. 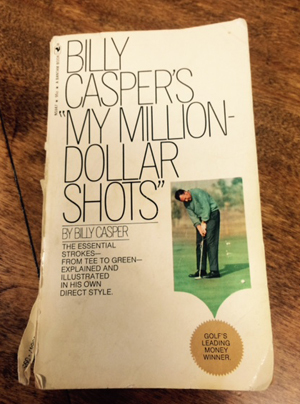 That’s when he picked up a book, “My Million-Dollar Shots” by Billy Casper, for 95 cents (it was back in the 1970s after all). He read it from the front cover to last page and began to improve his game. He would read the book at night and take notes along with him to play the next day. When he struggled with some shots, he would refer to his notes and fix the problem. 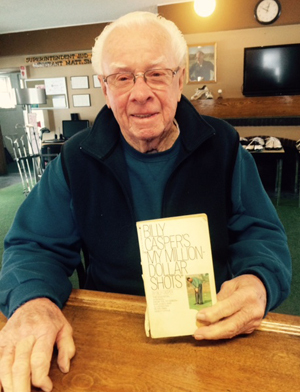 Scotty said he’s read a lot of golf books over the years, but this one in particular stood out to him the most. He’s kept it all these years and brought it in to us for a little show and tell. To this day, Scotty can shoot his age, he even posted an 80 at Enger Park earlier this summer! Even more amazing, he’s recorded seven holes-in-one at his beloved course. Congratulations Mr. McLeod, we are so proud to have you call Enger Park home! More information on Enger Park visit the website or call 218.723.3451.